A while back, my brother said to me that he played The Avengers on home video for the kids — that's my 15-year-old nephew, my 9-year-old niece, and two of the other kids who are always at the house — and they were just watching intently the whole time. So I asked that second one, my niece Fiona, which one her favorite Avenger was. Her answer was Thor, meaning she's a girl after her uncle's heart. So I asked her if she wanted me to read her some Thor comics, and she said yes, the same way I used to (and still do) read her some Golden Age Shazam/Captain Marvel comics, but I figured, what would I read her? 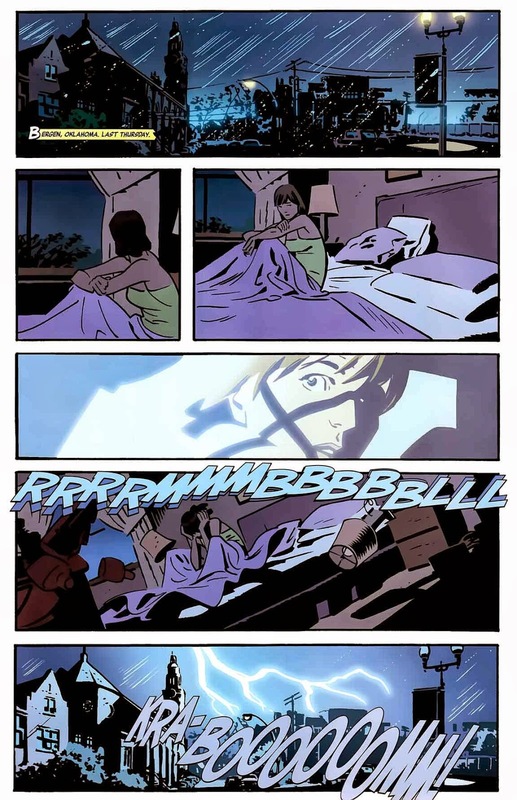 Jason Aaron and Esad Ribic's run isn't "cute" enough for her (she likes to call things "cute"), Walt Simonson's run is (I think) a little too dense in terms of words, and I considered the Stan Lee/Jack Kirby original run until I opened my Masterworks and remembered how much 60s-era sexism and racism there was. 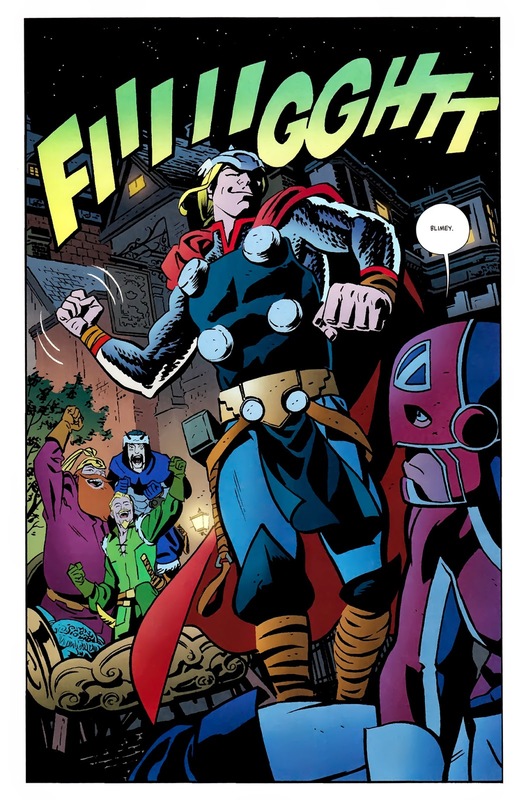 Fortunately, there was one universal answer: Thor: The Mighty Avenger by Roger Langridge and Chris Samnee, a stand-alone book with its own self-contained continuity. I've been meaning to get it for a while, since I love Samnee (Daredevil is one of only two titles I'm still getting on a monthly basis), and Fiona wanting some Thor to read just made me pull the trigger. I bought it first thing on a Wednesday morning, on a holiday. I went to my family's house, and she and I read it, with me reading the words and her doing the sound effects. We finished it in a day. 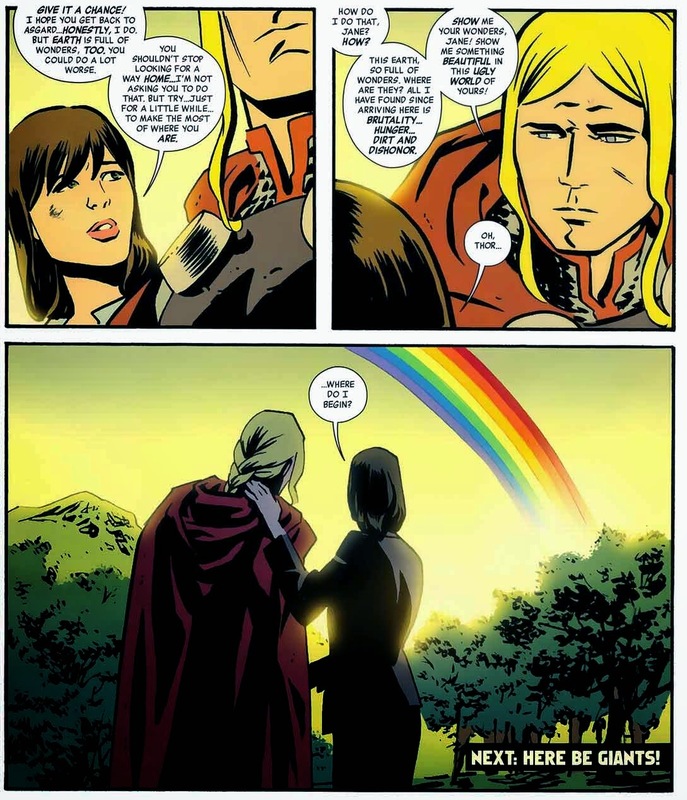 There's a lot to like in Thor: The Mighty Avenger, which sets the Thunder God in contemporary times, banished to Earth by Odin for reasons unknown and taken in and given a home by Jane Foster. For one thing, the art is pretty incredible. Samnee's got a style where you can tell what each character is feeling even if all the panel contains is a hollow outline of a figure with two dots for eyes and a quick line for the mouth (which Fiona kept pointing out to me every chance she got — she's related to me, after all), and man, it really helps. Some scenes are completely silent. The entire book starts out with these first two pages. Look at how much is established in those pages. 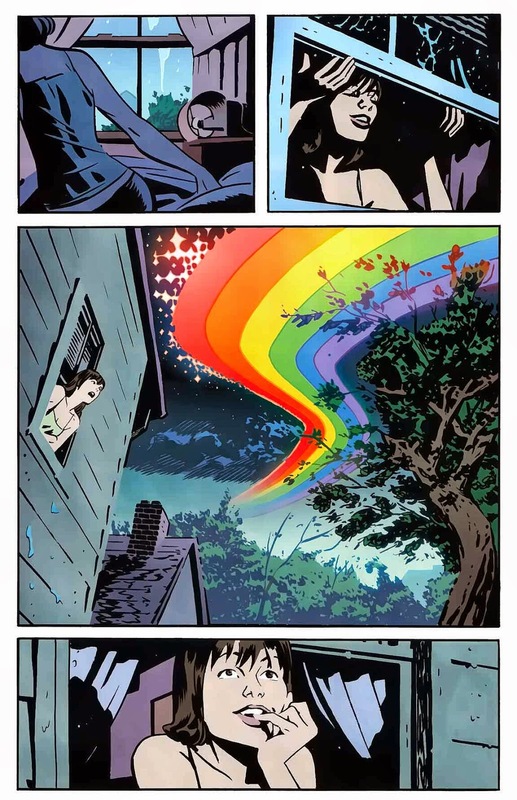 From Jane's loneliness to her sense of awe and wonder at a simple rainbow, Samnee's able to convey it with simple facial expressions and gestures. These are some inspired artistic choices — the everyday act of putting your pinky on your lip when you're in awe is still something many comics artists forgo. Samnee's mastery of body language is evident in Mighty Avenger. In fact, it's possible that even after so many issues of Daredevil, where Samnee pulls out trick after trick and fancy layout after fancy layout, it's in Mighty Avenger that I really appreciated him and his hold on fundamentals the most. Keeping layouts and compositions simple really highlighted his gestures and facial expressions. 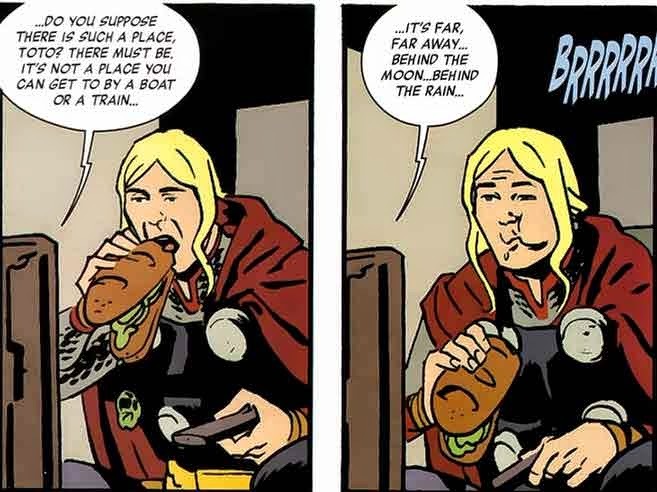 At no point, ever, does anyone say anything to the effect of "Thor loves to fight," but Samnee gets it across each time with a simple smile or smirk. It's not just Samnee, either. Roger Langridge does a good job with this kind of texture. It's no accident that Thor ends up watching The Wizard of Oz (which Fiona loved so much, because she loves that movie), right at the part where Dorothy's about to sing "Somewhere Over the Rainbow." 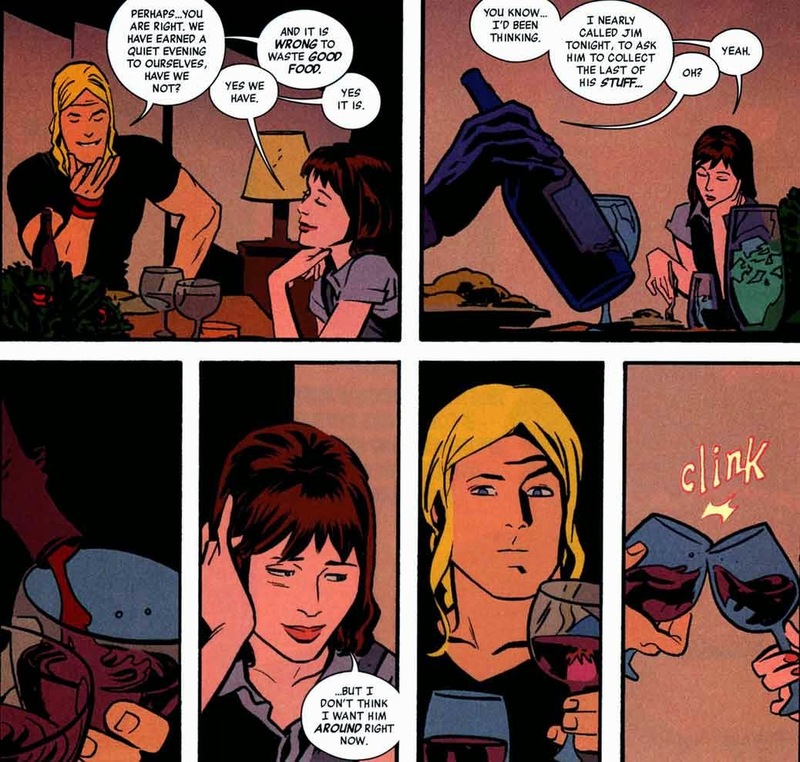 There's a genuine romance to Mighty Avenger and it's centered, of course, on Thor and Jane Foster. Thor's desperation to get back to Asgard and his growing acceptance for Earth is a focal point, and it doesn't happen without Jane. And if you couldn't figure it out from that dialogue, Roger Langridge is pretty good with words. And he's also pretty good at moments, too. In case you've been thinking "This is just for kids! ", well, first I'd say there'd be nothing wrong if that were true, but also, there's enough in there to provide a fun, layered experience for all ages. And of course, there's just some great fistpumping, adrenaline-rushing action throughout the book. 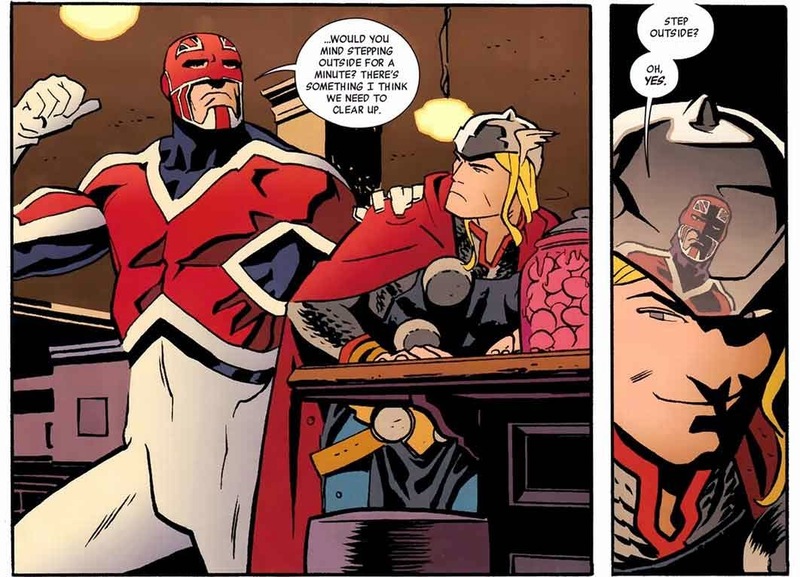 With guest stars like Captain Britain and Giant-Man (whom Fiona eagerly calls "Brian" and "Henry") and Wasp and Iron Man and Captain America, there's no shortage of punching, and boy, does Thor love to punch things. Thor: The Mighty Avenger isn't perfect. For one thing, it was cancelled four issues early and some of the main questions were never answered, such as why Odin banished Thor from Asgard in the first place, or who the hell Krask is (he's this guy, so don't feel too bad about not getting that big reveal), and I actually think it starts off a bit slow. But the characters make it. The moments make it. It's a comic that looks simple on the surface but has true, genuine beauty, and it's a comic about that very thing, about how things that seem simple on the surface, that you take for granted each day, can still fill you with wonder and awe, if you only stop to look. A half hour after reading Thor: The Mighty Avenger, Fiona came up to me with her iPad and, with a smile on her face, said, "Look. I made a Rainbow Bridge in Minecraft." 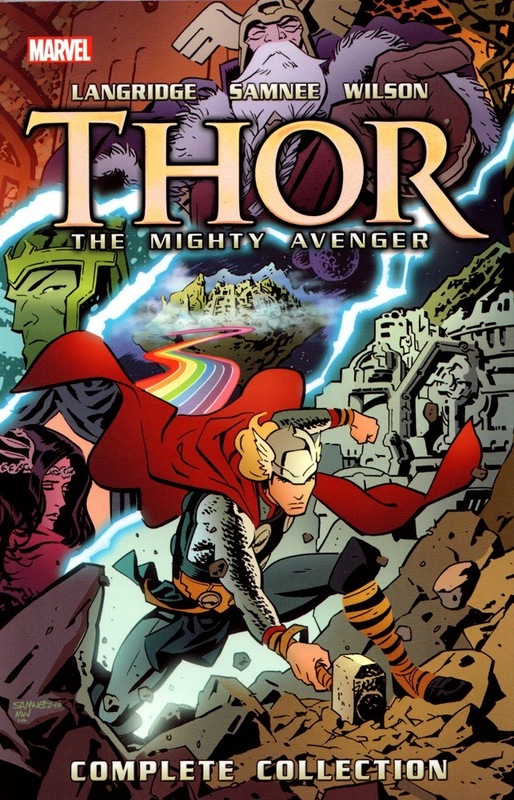 So, thank you, Avengers the movie, for giving me the impetus to buy Thor: The Mighty Avenger. And thank you, Roger Langridge, Chris Samnee, and company, for bringing me and my niece closer together, with the Marvel character that I'd be happiest doing it with.